Thomas Bailey, chair of the advisory board, and Malisa Simco, daughter of the Captains of the Salvation Army, with front office coodinator Michelle Myrtle passing out doughnuts Friday for National Doughnut Day. Capt. 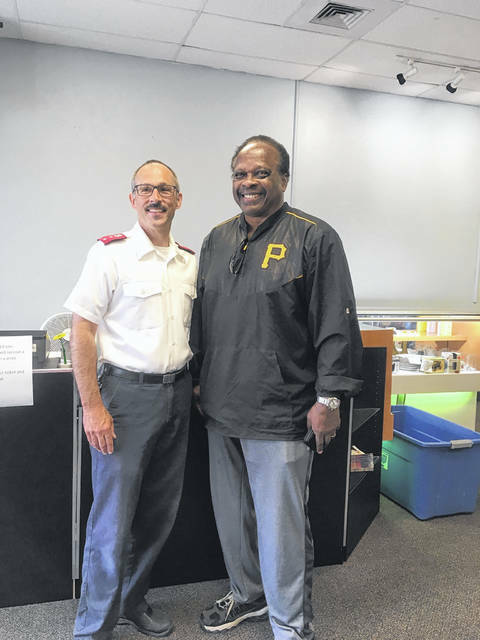 Dan Simco of the Salvation Army, along with Al Oliver, a member of the advisory board, inside the new store. Michelle Myrtle, Thomas Bailey, K.C. Chatfield, Capt. Dan Simco and Al Oliver posing in front of the new Salvation Army Thrift Store. The city of Portsmouth is continuing to improve its businesses and show growth. One such business, is the new Salvation Army Thrift Store. The local Salvation Army has moved its thrift store to 1424 11th Street in Porsmouth, a much larger space which will enable easier access for patrons to shop. The new store opened Friday. Some advisory board members were in attendance for the opening, along with some volunteers, and local Captains of the Salvation Army. The new store is a section of businesses that have received a major facelift on 11th Street, along with the Family Dollar store. Capt. Dan Simco and Capt. Misty Simco are the commanding officers for the Portsmouth-Scioto County Salvation Army. Tom Bailey is chair for its advisory board, his job to basically work with the executive board setting up a strategic game plan for the Salvation Army. The opening of the thrift store, he says, is Part 1 of that game plan. Bailey says his plans are to have a drive to have another administration building, gymnasium for the youth, create more programs for the youth, a drum-line team, expand and bring in youth, and a mentoring program. 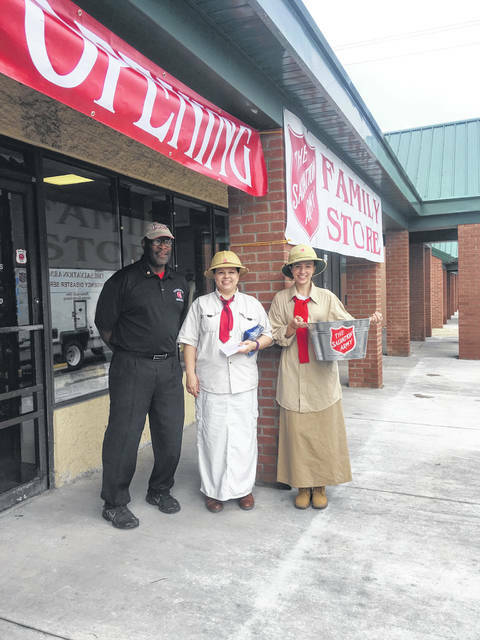 Portsmouth’s previous Salvation Army thrift store was small and difficult to use. The new building is about 4,000 square feet, and has easy front access and plenty of space to move around, “which allows us to obtain more clothing to increase the revenue for the Salvation Army,” Dan Simco says. The new building allows the thrift store to sell more and, therefore, provide more services in the community. The new store includes the show floor as well as an office. On a tour through the store, Dan Simco described how the different areas are used. In the back of the new store, behind closed doors, is a processing areas. In the far back — where long-time volunteers Earl (10 years) and Donna (six years) were working during the tour — is where Simco says the thrift store could always use more volunteers on a daily basis. Those wanting to donate items for resale at the thrift store should enter through the front doors if donating just a few bags, but for larger donations, access is requested through the back/side door. Volunteers sort the items to determine if anything needs to be cleaned or if there are other problems. (Simco says it is a huge help if items being donated are cleaned before being brought to the thrift store.) The items are then transferred to another section for pricing, and then placed on rolling racks to be made available for resale. Dan Simco spoke of a unique idea the Salvation Army uses at the store when it comes to selling shoes. Only one shoe of the pair is on display, with the mate held in the back in an effort to reduce theft. Former professional baseball player Al Oliver is a new member of the advisory board, which Simco explains is a new advisory board after the previous board became inactive. When the Simcos came to Portsmouth, a new, active advisory board was one of the things the Salvation Army wanted. Oliver was at Friday’s opening, greeting patrons and seeing how things had come together. The local advisory board consists of eight members: Jeff Smith, Steve Stray, Dave Pack, Keith (K.C.) Chatfield, Jay Hash, Al Oliver, Jeanette Langford and chair Thomas Bailey. Chatfield, who used to be a radio announcer but now works for STAR and is also married to manager Tammy Timberlake Chatfield, brought in some volunteers from the STAR program for Friday’s unveiling. Dan Simco says Chatfield brings in volunteers on certain days to help with the food program and occasions such as the store opening. The new store will also allow the Salvation Army to offer more adult and youth programming, Simco says. Simco says the two Salvation Army facilities have nine paid staff, which is why volunteers are so essential to the Salvation Army. The Salvation Army also celebrated National Doughnut Day in conjunction with the opening, with Malisa Simco, daughter of the captains, and front office coordinator Michelle Myrtle passing out the bakery goodies as customers entered the store. National Doughnut Day started in 1917 as a Salvation Army effort to alleviate depression of the soldiers in the camps. Two women officers, Ensign Helen Purviance and Margaret Sheldon, decided some home-cooking would lift the soldiers’ spirits, However, with limited options, they chose to make doughnuts. Those early efforts incorporated a wine bottle used as a rolling pin and a knife to cut the doughnuts into strips to twist the dough into crullers. And so began National Doughnut Day. The opening of the thrift store appeared to be well received with a stead flow of customers, as well as the young ladies who were passing out doughnuts and others who greeted people with a smile, making it another great thing happening in Portsmouth to show its growth. 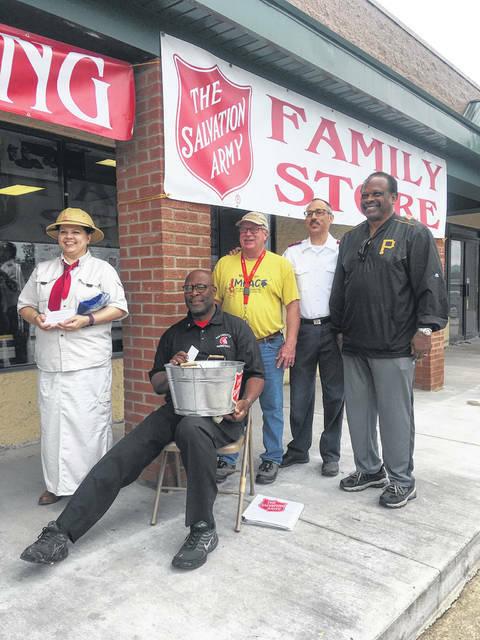 https://www.portsmouth-dailytimes.com/wp-content/uploads/sites/28/2018/06/web1_IMG_1412.jpgThomas Bailey, chair of the advisory board, and Malisa Simco, daughter of the Captains of the Salvation Army, with front office coodinator Michelle Myrtle passing out doughnuts Friday for National Doughnut Day. https://www.portsmouth-dailytimes.com/wp-content/uploads/sites/28/2018/06/web1_IMG_1415.jpgCapt. Dan Simco of the Salvation Army, along with Al Oliver, a member of the advisory board, inside the new store. https://www.portsmouth-dailytimes.com/wp-content/uploads/sites/28/2018/06/web1_IMG_1417.jpgMichelle Myrtle, Thomas Bailey, K.C. Chatfield, Capt. Dan Simco and Al Oliver posing in front of the new Salvation Army Thrift Store.